Rebecca of Ezra Pound Cake and I had the honor of choosing the theme for this month's You Want Pies With That. We asked the participants to come up with a pie that reminds them of a "Taste of Summer". Summer can conjure up seasonal fruit or carnival foods, but it can also be about sunburns and bored kids. I was one of those bored kids. The concept of over scheduled children driven around by a "soccer mom" didn't quite exist when I was growing up. My parents didn’t send us to camp or summer school. In fact, it was okay to leave children at home alone unsupervised for a few hours back then. My brothers and I would hang around the house and try not to destroy the house or each other. 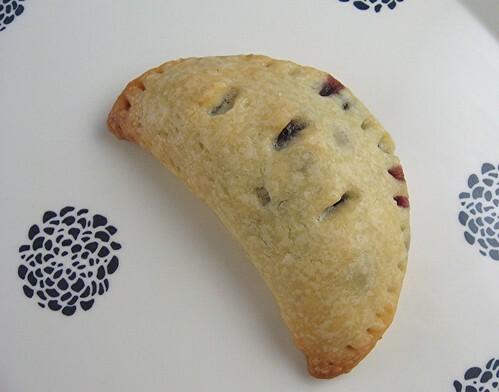 So I decided to bake some miniature blueberry hand pies as a tribute to that childhood summertime treat. Roll out your chilled dough to about 1/8-inch thick. Using a 4-inch round cutter, cut out 4-inch circles. (You can reuse the dough scraps once. Lay the scraps, side by side slightly overlapping and roll them between plastic wrap. Refrigerate dough for at least 15 minutes before cutting out more circles from the rolled scraps.) You should get about 22-24 circles. Spoon about 1 to 1 1/2 tablespoons of the blueberry filling, leaving a 1/2-inch border. Brush the edges lightly with cold water (to help the dough stick) and fold dough in half. Using your fingers, press the border to seal it and then press the border using the tines of a fork. 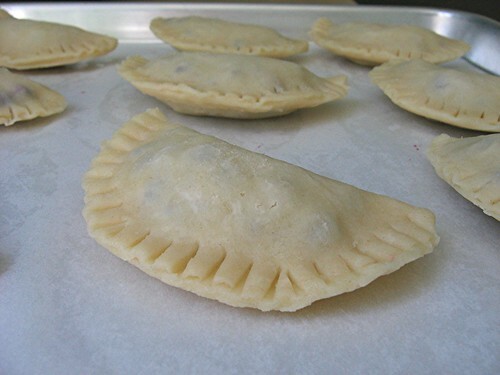 Refrigerate filled hand pies for 30-60 minutes. Preheat oven to 400F. If desired, brush the chilled turnovers with egg glaze and sprinkle lightly with sugar. Use a sharp knife to cut 3 steam vents into the top of each turnover. Bake at 400F for 15-20 minutes or until the pastry is lightly golden and the filling is bubbling. Let hand pies cool for 15 minutes before serving. 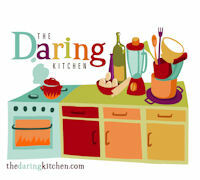 Divide the 7 ounces (14 tbsp) of butter into 2 portions: 4.5 ounces and 2.5 ounces (9 tbsp and 5 tbsp). Refrigerate the 4.5 ounce portion and freeze the 2.5 ounce portion for at least 30 minutes. Place the flour, salt and baking powder in the bowl of a food processor fitted with the blade. Process for a few seconds to combine. Add the 4.5 ounces of (refrigerated) butter and process for about 20 seconds or until the mixture resembles coarse meal. Add the 2.5 ounces of (frozen) butter and pulse until the frozen butter is the size of peas. Add the 5 tbsp of ice water and the vinegar and pulse 6-7 times. Pinch a small amount of the mixture to see if it holds together. If not, add another 1 tbsp water and pulse 3 times. Try pinching again to see if it holds together. If not, add the final 1 tbsp water and pulse 3 times. Divide the dough in half. Wrap each portion with plastic wrap and flatten into discs. Refrigerate for at least 1 hour and up to 2 days. Oh, they must taste wonderful! These sound fabulous! I love anything blueberry. Gorgeous pies! 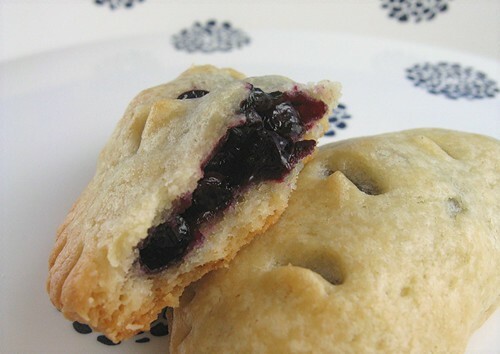 I made apple hand pies last fall, but I just adore blueberries. I plan on making these soon! these are so perfect! especially since we are going mad over blueberries right now! soeren will love these! Just today I went to check on how the wild berries are coming along. The blueberries have just another week until they are ready. I see blueberry hand pies in my very near future. Thanks for the recipe. Oh I love Hostess Pies too! In fact, I look at them at the store and want to grab one. I definitely want to try these! Beautiful! I did not grow up on the hostess version, though I remember the Mcdonalds apple pies? Blueberries...love it! I will really try this recipe since I have a bunch of blueberries in mu refrigerator...yummie! My mom didn't buy junk food, either, but when I could get it, I would pick the cherry Hostess pies. These look sooo much better! I was a fan of the Hostess Apple pie. :) My pie dough never looks pretty. I can't seem to get the hang of the pinching technique. Your look lovely. I made the salted p.b toffee cookies and they turned out beautifully! Thank you for posting the recipe. Those look so good...mine always get hollow...too wet of a filling? "Hand Pies" are definately going on my "gotta try it someday" list. Mmmm, this looks awesome! I loved those Hostess pies too, and this version looks absolutely delicious! John - It's possible that too wet of a filling creates too much steam between the filling and crust. But the vents should release the steam. That looks wonderful! I need to try that pie crust, I've never made a version with vinegar. these look far more delicious that the prepackaged convenience store ones that I remembering buying when my mom would let us ride our bikes into town. Great job! Anne - The acidity of the vinegar inhibits some of the gluten formation and makes the dough less elastic. Less elasticity means easier rolling and less shrinkage. How cute these are!! And they look delicious!! Oooh, I love blueberry pie. Your version looks wonderful, and portable to boot! Do you think the sour cream pie crust would work on this? Andrea - Yes, a sour cream pie crust would work here. Thanks for the trip down memory lane. We had a wonder bread thrift store close to where I lived and we used to go there to get cherry and apple pies. 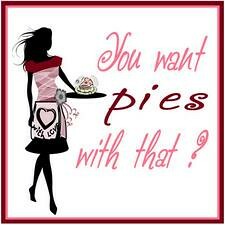 Hello Mary, I love these pies, they are really cute. I wanted to ask you if it would be okay to add your blog to my blogroll, I hope it is! Thanks for your woderful recipes, Liz. I just came across your blog & have spent the last hour (maybe 2), exploring it. INCREDIBLE! I've just recently, really started baking & I'm having a ball. There are so many wonderful baking blogs that are full of inspiration, but yours is just extra special! I plan on making "Hand Pies" tonight, but I'm going to use strawberry. Wish me luck & I will report back. Thanks for such a beautiful blog. I'm hooked! Liz - Feel free to add me to your blogroll. Hey Mary! Congratulations to us! Our pies tied. (I voted for yours by the way!-yummy!) If you want to e-mail me so we can come up with next month's theme it's email4jeanette @ gmail . com. Talk to you soon. I've never experienced the commercially produced version (British girl, here), but these sound so good - I have blueberries in the fridge that are starting to make me anxious (I just don't know what to do with them!) so hand pies may be the answer. Not to mention that these are the cutest things in the world. YOU'VE BEEN NOMINATED! Visit my blog for your award. These are so freakin' cute and yummy. We're having one of the best blueberry crops in years here in Michigan, so I made a double batch of these for a big bake sale where I work. I've never made a pastry crust with baking powder in it before. It was lovely to work with, and beautifully tender. It stands up to a little extra handling, too. How well I remember those lunchbox pies from childhood (and early adulthood). I've long since straightened out my dietary habits, but I still get primal cravings for things like that. Thanks for posting a terrific upgraded version. Those look great - blueberries are probably my favourite fruit that I grow in the garden but they very rarely make it to the cooking pot, usually I eat them all straight from the plant! Really good site btw, will definitely be back! Mmmm! Love how the hand pie revolution is making a comeback in the blogosphere! Made these after peach picking last month. So frickin' tasty! Oh my these look delicious! Oddly enough I made apricot/peach and apple whole wheat hand pies yesterday, only to have the dog sneak them. Yes, he ate the remaining 12! 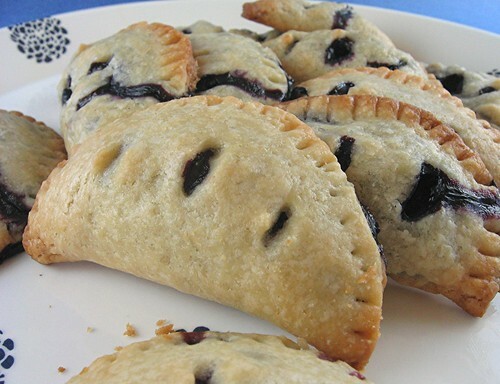 So tomorrow I am going to make the blueberry hand pies! I am sure a "tribe" of teen boys will greatly appreciate it!! I just love your blog! This is my first time here and I am so looking forward to spend time perusing it!